Fabiola’s family called 911, and an ambulance took her to a hospital in San Pablo, where they performed a CT scan and discovered bleeding in the brain. The San Pablo hospital staff immediately sent Fabiola to UCSF Benioff Children’s Hospital Oakland by ambulance. The drain in Fabiola’s head helped relieve her symptoms, but it didn’t address the cause of her problem. Fabiola seemed to be improving, but a few days later, Alma noticed that the teenager had developed a weakness on the left side. “I mentioned the weakness to the doctors, and they performed an MRI to find out what could be the cause,” says Alma. Fabiola’s left-side weakness was due to a minor stroke that was another consequence of the bleed in the brain. The MRI showed an abnormality that was likely congenital (present from birth). Ordinarily, the arteries and veins in the brain are connected by tiny blood vessels called capillaries. With Fabiola’s abnormality, the arteries at that location connected directly to the veins, bypassing any capillaries. This condition is called an arteriovenous malformation, or AVM. A few days after the shunt was inserted at Children’s, Fabiola was transferred to the San Francisco campus for an angiogram to examine the blood vessels. An angiogram is an X-ray image that uses a special dye and camera to take pictures of the blood flow in arteries and veins. A gamma knife is a large machine that delivers direct radiation to the abnormal blood vessels, causing them to slowly collapse and seal over a period of weeks to months. Alma hasn’t forgotten the dates of the two gamma knife procedures, either. “Fabiola was discharged from Children’s on July 3, and then on August 30, she had the first gamma knife procedure at UCSF,” she notes. 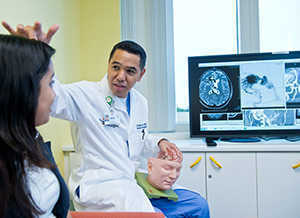 “Then she had the second gamma knife procedure on February 14, 2012. She improved after the procedures, but then on December 19, 2013, she had a relapse with more bleeding in the brain. She was at school, and she started vomiting and had a severe headache. She was taken back to Children’s by ambulance. Fabiola continued to heal, and Dr. Auguste monitored her progress with periodic MRIs. The hope was that her gamma knife treatments had decreased the size of her AVM enough to finally make it treatable with open surgery. Both Alma and Fabiola remember the date of the final surgery at Children’s. Now age 16, Fabiola appreciates the care she received and is excited about her prospects for the future. “The nurses at Children’s were like family to me,” she says. “Genie and Wanda, especially, spent a lot of time with me. The people at UCSF were sweet, too, bringing me treats.